The next time you need a simple appetizer for an event, let me recommend this one. There are endless variations and it takes next to no time at all to throw together. It works for football games, it works for kids, it works for girls' nights... why? Because it's easy, delicious, and adaptable. I originally spotted this idea on Pinterest... it's my latest internet obsession and I've pinned about 4,000 things and made about five of them. In honor of the "Pinterest Challenge" (see the details here, here, here, or here and check out all the other Pinterest projects), I had to get this posted today so I could play along. There are several variations of this appetizer floating around, anything from a warm and gooey cinnamon roll version that I figure would be great for a brunch, to the "bloomin' onion" spin-off, to the bacon-loaded "crack bread" version. I opted to go with a pizza version this time around. Of course, I modified it a bit, I don't like pepperoni so I used Italian sausage. It takes about five minutes of hands-on prep time and a little patience while it's in the oven. You may need to adjust the quantities slightly depending on the size of the bread boule you buy. (Did you know boule is a fancy way of saying round when referring to bread?) You can also try several different types of bread but I used an Italian bread for this one. Depending on the flavors you add to it, you may want to consider sourdough or other types. In a medium skillet, brown sausage and crumble as it cooks. Drain well and set aside. Prepare a baking pan by lining it with aluminum foil. Preheat oven to 350 degrees. Carefully slice the bread in long slices, taking care not go all the way through. Turn the bread 90 degrees and cut slices the opposite direction, again leaving the bottom connected. The second set of cuts will be a little more difficult to make. If your bread is very soft, you may want to put it in the refrigerator for about thirty minutes before you try to cut it so it is a little easier. The cuts don't have to be perfect though so don't worry if your lines aren't straight and such. Next start tucking the crumbled sausage and the shredded cheese into the cuts in the bread, pack it in as much as possible. In a small bowl, combine the melted butter, garlic, oregano, red pepper flakes and Parmesan cheese. Pour butter mixture over the top of the bread. Cover the bread with another piece of foil, molding it down around the bread, and bake about fifteen minutes, uncover and continue baking about ten more minutes until the top is golden and the cheese is all melted. Serve warm with pizza sauce. I'm not on Pinterest so I'm very glad you found this there, made it and posted it. 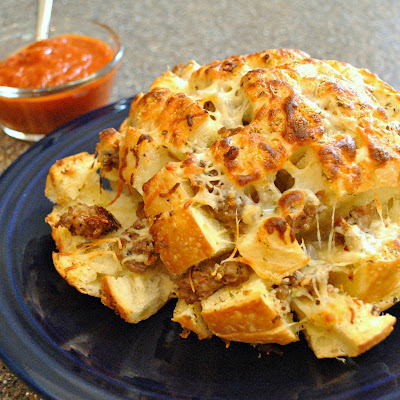 This Pizza Bread looks amazingly good. This looks so good! I definitely want to make this! I found a cranberry orange muffin on pinterest. I followed the link to your blog. I made them, they were delicious. You have a great blog--glad I found you! sounds great but what temp and for how long do you cook it?